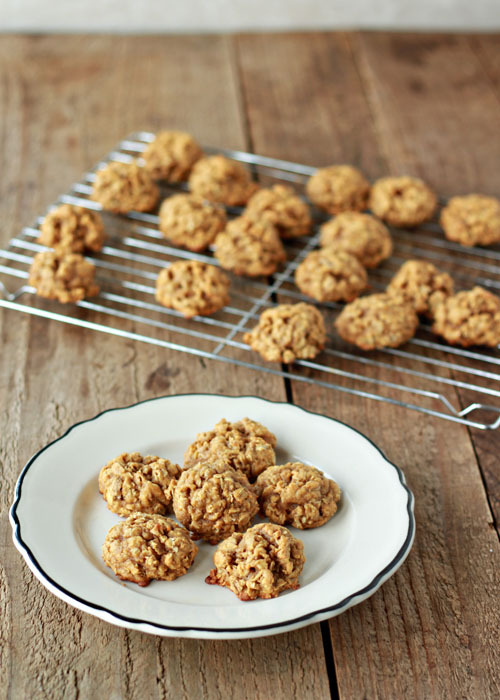 Pumpkin, cinnamon, nutmeg, and other wonderful pumpkin spices are the perfect addition to your traditional oatmeal cookies. Pumpkin, pumpkin, pumpkin! Can you ever get tired of pumpkin?! That’s rhetorical question. At least, coming from me it is. But if you asked my guy, he’d have a decidedly quick actual answer. I think he continues to remain sick of pumpkin thanks to last year’s Pumpkinpalooza. 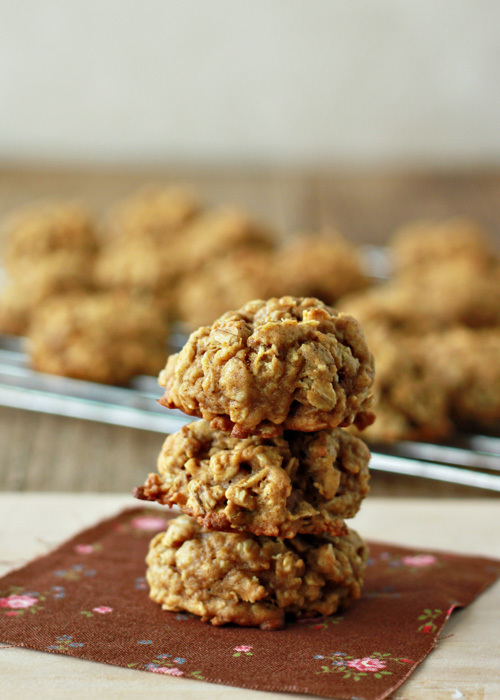 So for these moist, chewy little gems, I essentially just took the oatmeal cookie recipe straight off of the Quaker box and tweaked it to make it all pumpkiny. 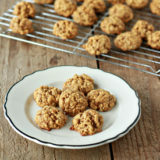 Pumpkin puree (of course), pumpkin spices (mmm, cinnamon, nutmeg, ginger, cloves) … lots of chewy oatmeal and a cookie scoop to make them perfectly round and perky. I love how these cookies just sort of stand tall and say, hey. We’re here, and so is fall, and dangit, there is NOTHING WRONG WITH PUMPKIN! BRING IT ON! Preheat oven to 350 degrees Fahrenheit. Grease a baking sheet, or line it with parchment paper or a silicone mat. In a large bowl with a hand mixer or in the bowl of a stand mixer affixed with the paddle attachment, beat the butter and sugars on medium speed until well-blended, about one minute. Add the egg and beat until incorporated. Add the pumpkin puree and vanilla extract. Mixture may appear slightly curdled, but don’t worry! It’s all good. In a medium bowl, whisk together the flour, baking soda, salt, cinnamon, nutmeg, ginger, and cloves. With the mixer on slow speed, add the dry ingredients to the wet, and mix just until blended. 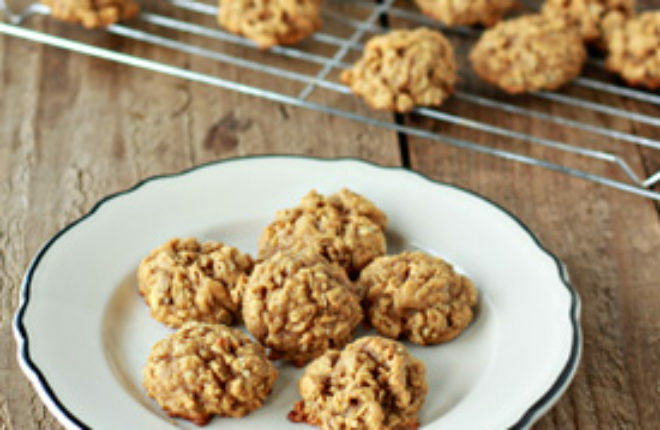 Add the oats and mix just until incorporated – overmixing will lead to a tough cookie. Nobody likes tough cookies. Scoop onto cookie sheet in three-tablespoon mounds (I use a 50 mm cookie scoop). Place about two inches apart. Bake at 350 degrees for 10 – 12 minutes, until set and beginning to turn golden. Let sit for 5 minutes then transfer to a cookie sheet to cool completely. They keep well at room temperature in an airtight container for 3 – 4 days, or freeze in a zipper bag for 1 – 2 months. I am a nut for pumpkin and I will absolutely try this recipe, especially on the upcoming cool weekend! I’m a purist and will likely enjoy this as is but have you tried adding milk/white chocolate chips? I wonder if I should add more spice to avoid drowning out the perfection of pumpkin spice? Any suggestions for making these with a sub for the egg? I love this recipe but am confused by the 4 dozen it is supposed to make. When I scoop 3 T for each cookie, it barely makes 2 dozen.